Time-tossed vampire Barnabas Collins is leaving his family’s mansion, when he catches sight of a pretty young woman who looks like someone from Charlie’s Angels. This is Daphne, the mystery ghost who is destined — a hundred and thirty years from now — to collude with an angry fire god to destroy Barnabas and his entire way of life. So obviously he wants to stop and say hi, and find out what the hell is going on, with an eye towards possibly not having this girl embark on her weird post-mortem vengeance spree. He approaches her at a traffic stop, and asks for her license and registration. Now, when we saw Daphne’s ghost in the future, she was a governess, which is one of the all-time most destructive professions in history. Barnabas asks why she’s here in the woods, and she says that her carriage broke down, which is exactly what governesses always say. A governess’ carriage breaking down is basically a prelude to a wave of terror that she will blame on everybody but herself. He accuses her of waiting for Gerard Stiles, a name that she doesn’t recognize, because Barnabas doesn’t know where this moment is in her personal timeline, and he wasn’t fully briefed before embarking on this irresponsible time cop assignment. “But you haven’t told me your name,” he points out, and she says she doesn’t want to. “I’d hate to have to force you!” he growls, and then another character emerges from the underbrush. 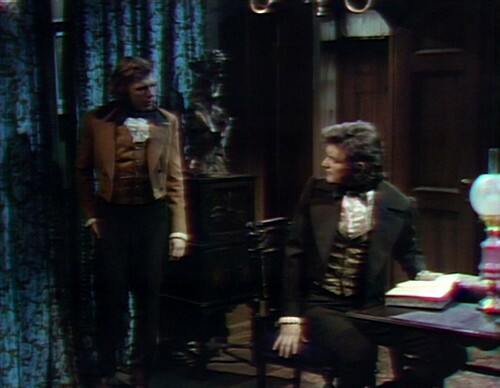 “Why would you do that, Barnabas?” Desmond asks, and why indeed? Barnabas already knows her name. It’s practically the only thing he knows about this entire decade. 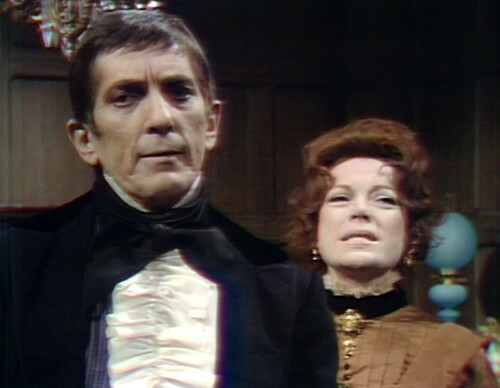 It’s hard for Barnabas to explain why he’s so interested in Daphne, because all he knows is that in the future she’s going to be a ghost, and that’s not really evidence of anything in particular. He’s in the past; all of these people are going to become ghosts at some point. The planet is chock full of future spirits, which probably explains why the world is in this sorry state; it’s inhabited entirely by potential poltergeists, just waiting to die and unleash their psychic anger on everybody else. So he’s not really prepared for the intrusion of Desmond, who appears to think that he’s handsome and rich and can do basically whatever he wants with the random female prowlers who show up on the grounds, hoping to be discovered and become main characters. Desmond’s got an unearned swagger that I don’t believe in yet, given that the only thing we know about him is that he just got back from the Far East, and he brings home lousy souvenirs. Daphne ends up leaving the scene with Desmond, preferring the preening bachelor to the weird undead time-traveling traffic cop who knows her future, but doesn’t understand her present. Desmond considers this a lucky break, but it’s hard to stay lucky in this town. So Barnabas scurries back to the house for a bracing round of Junior Detectives with his life partner and co-impostor, Julia Hoffman. They line up in the drawing room, each consulting their own personal teleprompter, and start in on the speculating. 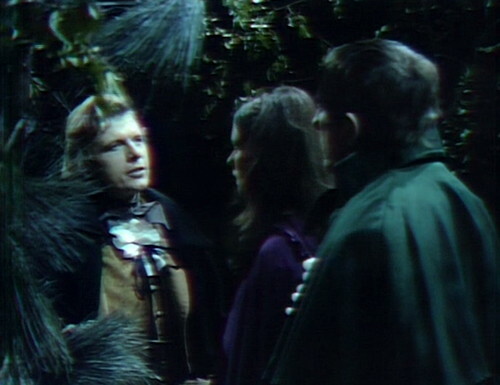 “She would have come here, exactly.” Barnabas shakes his head. “No, she was here for some other purpose.” This is how the Junior Detectives behave; they make snap judgments and then invest faith in them. I’m not sure why Barnabas doesn’t believe in carriages breaking down. It was probably the transmission, it usually is. Meanwhile, at Rose Cottage, the drama is unfolding, in its own crackpot way. Desmond the ladykiller is currently surveying his new acquisition, a magical decapitated head that he’s not quite sure what to do with. This is what he brought back from the Far East, as a present for his best friend Quentin. He thinks it’s a carving of a head, and I think it’s a real head, but either way I’m not sure why you’d bring it back from somewhere, or why you’d want to keep it in a glass case and hide it behind a curtain. I’m also not sure why you’d have a curtain in the middle of your drawing room that you can conceal heads behind. There’s got to be other places you could stow a head in a box, although I can’t think of any off the top of my — well, you know. And how far was the Far East, anyway? Maine is already about as East as you can get, except for Nova Scotia. When Quentin comes over to play, Desmond closes the curtains and pretends the head isn’t there, because he’s decided not to give it to Quentin after all; he wants to keep it and glare at it and eventually get possessed by it. Quentin’s here to establish a couple more characteristics, if he can, because he’s probably important and so far we don’t really understand him that well. Things that we currently know about Quentin include: he was lost at sea and then backpacked from Brazil to Maine without passing a post office; he’s pretty chill about his wife marrying another dude; and he’s interested in the occult, whatever that means. So that’s perplexing. I’m actually not sure I can understand Quentin; he’s kind of a lost world himself. I mean, Julia spent a lot of time in 1970 studying Quentin’s old diaries, but she doesn’t seem to know anything in particular about him. Being lost at sea and South America for six months is a big life event, but apparently that wasn’t important enough to be mentioned in his journal — she’s surprised when he comes home, and she doesn’t know what’s going to happen next. If he’s a jigsaw puzzle, then she got a pretty good look at the picture on the front of the box, but she doesn’t seem to recognize anything she sees. But her research did uncover one important clue — a blueprint for a Proposed Stairway Into Time, which apparently works, because that’s how she got to this century: a wormhole opened in the continuum right in front of her, and she hopped on board. We haven’t seen Quentin working on this yet, and we don’t know if he ever used it to get anywhen, but he drew up that blueprint this year and it’s already October. And there’s another unexplained mystery hiding in plain sight, which is: Why did he go to sea? I mean, he took his son on a ship, and sailed someplace within swimming distance of Brazil in the company of a notorious gun runner that he considers a close friend. Was this a business trip? A fishing expedition? Where did he think he was going, and does it matter that he never got there? And why does he have two best friends that don’t seem to know each other? There is a lost world, and it’s right behind him, just past that curtain. Desmond knows about it, and so do we; the only one who’s in the dark is Quentin, who’s the most interested of all. And he’s about to be contacted by the unknown, because Daphne sneaks into Collinwood to leave an anonymous message for him. She’s the last missing piece of this jigsaw puzzle, and she apparently has an unending supply of broken carriages, taking her back and forth to wherever mystery governesses come from. When she breaks in, she overhears the Junior Detectives conspiring in the drawing room, just declassifying information with the door open. “Oh, Julia, how long can we keep up this charade?” Barnabas asks. “Pretending to be people that we’re not!” And Daphne just backs out of the foyer and lights out for the territory. As far as she’s concerned, this is exactly the kind of problem that belongs to somebody else. 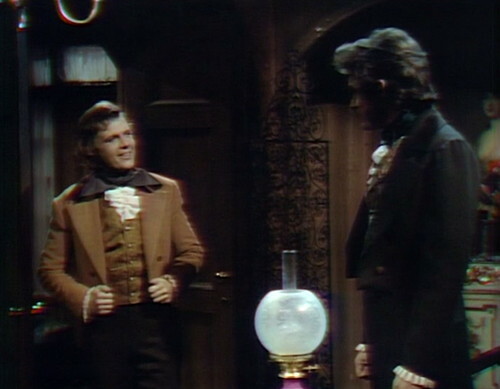 “You know I think I’ll go to Quentin, and tell him everything,” Barnabas says, in a rare moment of potential candor. Obviously, Julia says, “Absolutely not!” because she’s one of those mythopoetic trickster figures that you hear about, like Anansi the spider, Reynard the fox and Amanda Woodward from Melrose Place, and she knows that the first rule of imposting is that you don’t go around telling people everything. “But he’s the only person that would understand!” Barnabas cries, and he’s right — if Quentin is drawing up and constructing Proposed Stairways Into Time, then he would probably be thrilled to know that his first customers are already here, leaving positive Yelp reviews before he’s even finished building the thing. But he would also be thrilled to know that there’s an occult head in a glass case right behind him, staring moodily at the back of his neck, or that Sabrina from Charlie’s Angels is sneaking into his house and leaving him cryptic valentines. Quentin is already in the lost world; he’s surrounded by it. There are secrets and mysteries just on the other side of any door he walks by, it’s just that nobody wants to tell him about it. It’s dreadfully unfair, and I wouldn’t blame him if he refuses to build the Proposed Stairway after all, leaving everybody stranded in a paradoxical never-was. See how they like it, for a change. It looks like Daphne jumps a line when Desmond approaches her in the woods. As he’s saying, “My –” she blurts out, “My carriage has broken down near the main gate.” He chuckles, and continues the scene. When Gabriel mentions that Julia might look at his legs, you can see marking tape on the floor behind him. When Desmond walks around the head, you can see past the wood-paneled wall to another plaster wall behind it, which juts out at an odd angle. I do not understand the architecture of the Rose Cottage drawing room. We hear Judah Zachery’s voice for the first time in this episode. Michael McGuire is playing the Head, but Keene Curtis plays Judah’s voice in two episodes — this one, and 1140. Curtis won a Best Supporting Actor Tony in 1971 for The Rothchilds, and he performed voices for several cartoons — Scooby and Scrappy-Doo (1979), Space-Stars (1981) and The Smurfs (1981). In the mid 1980s, he starred on Broadway in La Cage aux Folles, and he also had a recurring role on Cheers as Sam’s rival barkeep, John Allen Hill. As I said before, apart from DARK SHADOWS and Judah Zachary, I always think of Michael McGuire as the man who accidentally kills his wife and then gets blackmailed into helping with a DELIBERATE killing, in a very good COLUMBO episode. I just saw it again two days ago, fittingly. In that story, he wears a pretty convincing toupee, so that’s one more reason you have to be TOLD it’s the same actor (as if not playing a disembodied head didn’t make it tricky enough). This might be a good place to note the number of actors from Dark Shadows who also appeared on Cheers. Besides Keene Curtis as the restaurateur and Michael McGuire as Diane’s mentor / fiancee, Cheers also had Donna McKechnie as Sam Malone’s ex-wife, Camila Ashland as the headmistress of Carla’s former school and Michael Currie as a business executive in the company that bought the bar. Ah, Kosmo, you have entered my field of expertise! I compiled a document a few years ago, & I update it every year, with information on every movie, mini-series, soap, & TV show (& Broadway play) with any DS connections. It’a a little over 200 pages now. You did a great job on Cheers. , I would also add that Donald Hotton, Reverend Brand in ep 969, officiating at Jeb & Carolyn’s wedding, also makes an appearance in Cheers season 10, ep 11, “I’m Okay, You’re Defective” as a lawyer. Also, Michael Stanislavsky, associate director in a dozen or more DS eps, was also assistant director in one of Michael McGuire’s episodes. That sounds more like a Barnabas line than a Quentin one. Quentins aren’t usually that vague. If i was Desmond, and there was a question or doubt about whether the head in a jar in my living room was a sculpture or a real stray noggin, I think I’d open up the jar and poke at it. Heck, I’d probably poke at it either way, because I’m basically ten years old. Oh yeah, my brother and I would already have taken that head out and thrown it back and forth like a basketball. Then my sister would have put eye shadow and lipstick on it. Judah would be screamin’ for help if he’d been at our house. Think he’d look good with pigtails? A painted-on mustache and blacked-out teeth, at the very least. With a goatee and drawn-on eyeglasses. How about a cowboy hat? And a lit Marlboro between his lips. Or a Rastafarian hat, and a big doobie between his lips. And do up his hair in dreadlocks. Or a tall white Marie Antoinette wig and Versailles make up job complete with painted on beauty mark. He could go like that to the next Collins family costume party. How about running the family business? Who’s doing that anyway? Bill Malloy’s great, great, great grandfather? I wonder who took out the bleeder valve of Daphne’s carriage. LOL! The same one who took out the bleeder valve when Vicki’s carriage overturned in 1795. So in the between bleeder valves and supposedly dead amnesiac strangers for the title of cause of most road accidents, bleeder valves are in the lead. A distant third is Collinsport mud, an unexpected hitch in the arrival of the DuPres party for the Collins-DuPres wedding. I thought the bleeder valve was from the horse! Barnabas had the original bleeder valve. 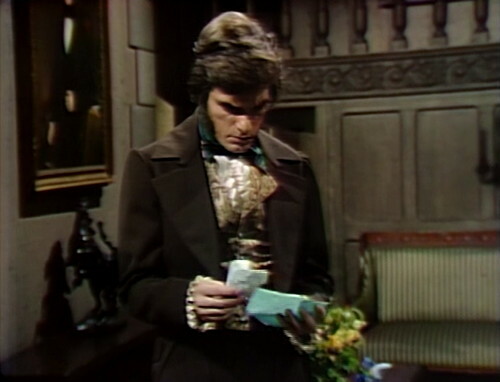 If Barnabas and Julia really wanted to prevent the destruction of Collinwood in 1970, they could go back to the present, point the I Ching wands to the day before the destruction or something… and just get rid of that green flag — burn it, toss it in the sea, whatever. But, some folks need to take a walk around the block just to get across the street. Since Roger Davis was originally considered for the role of Desmond, I’m glad it went to John Karlen instead. With all the extravagance of 1840 — the period costumes, the labyrinthian story turns, etc. — John Karlen has the right theatrical flair for the part. Did you know that Roger Davis was in an episode of Rod Serling’s The Twilight Zone (Spur of the Moment, from the fifth season)? …and he holds on the entire time he does his dialogue, working his thumbs in those trademark sporadic massaging movements. 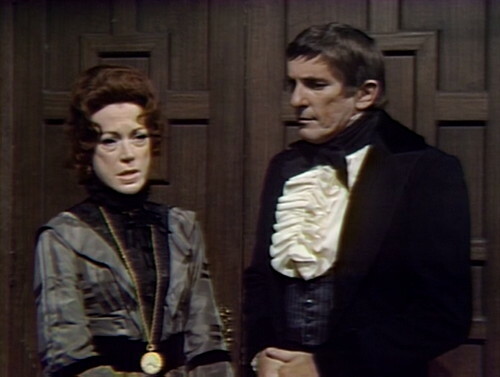 Did Roger Davis ever do the “chin grab” with any of his female Dark Shadows co-stars, catatonic Sabrina perhaps? It’s something he does when he wants to adjust the positioning of a co-star’s head, so that she’ll be facing him directly. Remember how in 1968 Jeff Clark would always grab onto the side of Vicki’s face and head, like an eager child clutching a football just before he gets ready to kick it? Well, in The Twilight Zone, he did that too. He was also tactile with the male co-stars, in a typically aggressive way. With the man trying to bar his way into the mansion, Davis’ David Mitchell grabs him by the arm to push him aside. And when another man in that scene gets Mitchell to release his grip on the young lady, he reacts by punching the man in the face. He really made an episode of it. In fact, everything known to Dark Shadows fans regarding Roger Davis’ decidedly hands-on approach to acting was being honed to perfection in that 1964 Twilight Zone episode. He even slapped Marsha Hunt in this episode. Now this was perfect casting on Twilight Zone’s part because Roger Davis wound up playing such an annoying character. He started out fine, but in the flash forward, he was such a loser, and he took others down with him. I really liked this episode of TW; it really spoke to me. Collinsport. Sometimes you want to go where everybody knows your past. Sam Evans was the Norm of the Blue Whale. I bet Karlen could be a great Cliff. Which turned him into an even more over-concerned, over-acting, cloyingly nice actor that plays a character which they can kill off again, and nobody cares, and when the ghost arises, it’s Addison Powell. And nobody cares. In the audience. Really, could Mitch Ryan have been so bad to be replaced by George? Who was okay in the beginning, but he got sensitive to others to the point of suspicion….like he’s hiding something. Count me a Mitch fan who laments. The problem with Mitch was his drinking problem getting out of control. Things like being nowhere to be found, or passing out. Fortunately he got over it, and resumed his career. Is that where he found the pen? A governess’ carriage breaking down is basically a prelude to a wave of terror that she will blame on everybody but herself. The moral of the story is: Rich people should never educate their children. Better pig-ignorant than bloodless and shredded under a shallow pile of leaves in the haunted forest. This. If the Collins children are not being taught by governesses who leave a trail of death and destruction in their wake, they’re being educated at schools run by sadistic, hypocritical clergymen! Or – they’re being educated by out of work waitresses. What were Vicki’s qualifications? She was eighteen years in a foundling home, no educational credentials were mentioned – that I can remember. And she never gave any references to Joshua and Naomi in 1795, either. 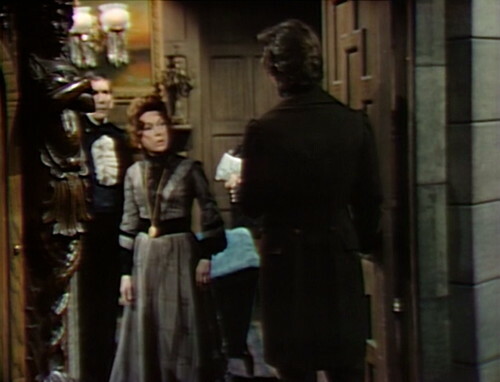 Barnabas just had a good feeling about her, and Sarah was absolutely certain she was a governess, so voila! I never got the impression Vicky was only eighteen. Liz said Carolyn was about Vicky’s age, which I took to mean she was about twenty. 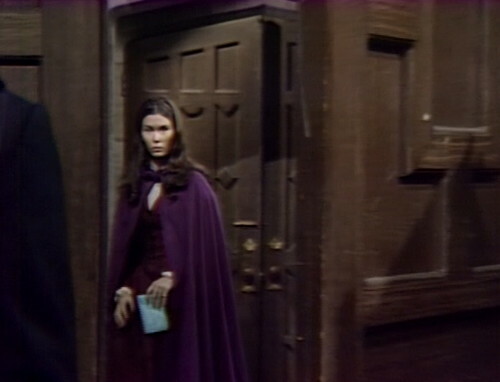 I know that in the original bible for Dark Shadows (Shadows on the Wall), it was stated that Vicki had indeed obtained her teaching credential and was around 20 or 21 years old. I think it did mention that she had done some teaching at the foundling home. In the original story, as written by story creator Art Wallace in Shadows on the Wall (the original story bible), Vicki was twenty and Carolyn was seventeen. This is also how it’s presented as the series begins. 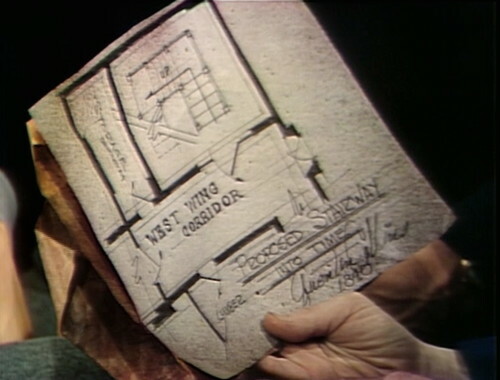 There’s no mention of Vicki having received any teaching credential, and not being in the public school system she likely didn’t require one; in the first episode when she’s discussing with Mrs. Hopewell the letter from Mrs. Stoddard offering her the job as governess, she mentions “living and working” in the foundling home, and in the flashback when she’s packing for her trip to Maine it’s as a foundling home resident. I stand corrected. It must have been in one of those Dan “Marilyn” Ross novels or some other source that I read that Vicki had obtained her teaching credential. You’re certainly right that she didn’t need one to be a governess. Look at the homeschooling parents of today – they are not required to have a credential or to have even graduated college. Being at the Foundling Home Vicki would have had to live with children who perhaps would have had a sour outlook on life. Maybe that would have been seen as evidence she could get through to David, very much a problem child however much Elizabeth didn’t want to think it. Meant to add: while it’s true she didn’t have references to give Joshua, but even he was impressed with her list of qualifications. And he did say she was on a trial basis. Yeah – and she didn’t appear to have small pox or anything. Joshua would have been far more concerned with whether or not Vicky had a criminal record than whether she could teach Sarah long division. She was in the beginning….smart, young, pretty, and 1795 started the process of writers dumbing her down, and from Barnabas to Jeff Clark to Anthony George, it was all about a man in her relationships, and bad for me, then, since my first ep was after seeing Jeff Clark on the road, and I was so happy when I discovered The Beginning. When you factor in how limited the Collinwood budget was in 1966, it makes sense that they’d go cheap when hiring. I don’t know why but I always got the impression that Vicky was a trained teacher though. If she’s not then that makes it even more suspect that Elizabeth would pluck her right out of the air to be David’s governess. She earned her keep by staying on to teach what she had been taught. The perfect resume for a homeschool teacher in a soap opera. She went through all grades, graduated, then taught. Good enough. For Paul’s daughter. I guess so. But, I still wanna believe Vicky is Elizabeth’s long lost daughter. I think Elizabeth knew or suspected Victoria was her daughter (or had some other tie to the family) from the get-go. Let’s not forget, Mrs. Stoddard was very good at keeping a secret. It’s too bad they never had a chance to explore that storyline. But by the time Barnabas and Julia became a hit, they no longer had patience for the plain ol’ Gothic stories anymore. Seems to me that they could have fit BOTH storylines into the show – but I guess Collinsport just wasn’t big enough for a vampire AND a Jane Eyre, and she had to be a Jane Eyre-head instead. I wonder if a different actress might have brought a different outcome? I always wanted them to find a supernatural twist in Vicki’s past. Dan/Marilyn Ross had an idea he never developed that Vicki was the daughter of Elizabeth’s best friend, who had an affair with Barnabas while her doctor-father was trying to cure Barnabas’s vampirism. 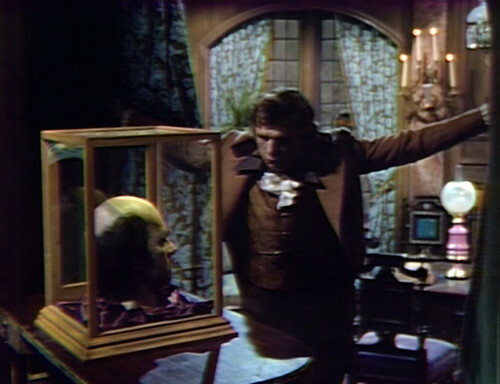 In Ross’s parallel world, Barnabas did go to England and never was chained in the coffin. I rather like this idea, though having Barnabas a Vicki’s father would complicate things.